In the previous post I mentioned that perhaps you want to have two Joomla 3.0 Super Administrators. This will help in case you forgot the password for one, hopefully you didn’t forget the password for the second one. So I created another Super Administrator account for my Joomla 3.0 website. The new interface looks really pro, neat and clean. It’s vastly different from before and so far I’m loving it. 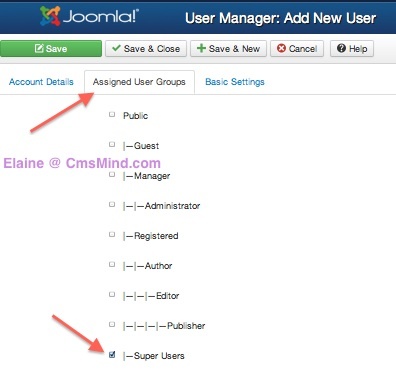 The Joomla 3.0 user manager is where you can see all the users active or inactive on your website. 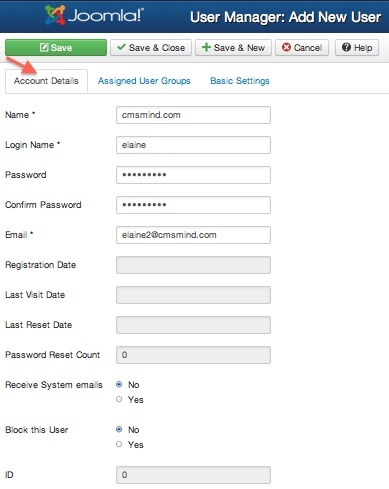 You can do many things in the user manager including create new users, change passwords, change groups, create groups, change user details, block users and more. You will create a new super administrator user in the User Manager. For best practice, don’t name any of your users admin or root. Here you will enter your new Joomla 3.0 super administrator details. Please use information relevant to your website. Enter in your own name and email address. Now your Joomla 3.0 super administrator needs super administrator rights. To do this, you will assign the new super administrator to the ‘Super Users’ group. You can select default screens for different template styles, editors, languages and more for individual users. I just kept the defaults for all of them. You are done creating a new Super Administrator account. You will see the success message in the next window. Creating a new Super Admnistrator was really easy in Joomla 3.0. It wasn’t that hard in previous version either. 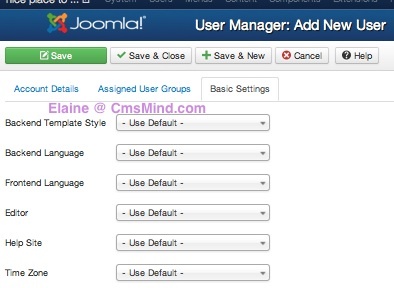 The difference is that in Joomla 3.0 there is a separate tab for the ‘Assigned User Groups’ and Basic Settings. The only gripe I have when creating a new user is that I can’t see the name of the user I’m creating. I would have liked to see that when I changed to different tabs. can you tell me how to remove a super user? I’ve created a tutorial on how to block or delete a super user. The link is here. i created a new user with super user rights but when i loggin from the front end using that account am told “you are not authorized to view this resource”.its a travel listing website and i want that user to be able to submit a listing from the front end.With the original super user account am able to do that from the front end.How can i go about that? thanks!